Toshiba's got a new hybrid tablet-laptop for budget conscious travelers looking for a lightweight system to tote with them. 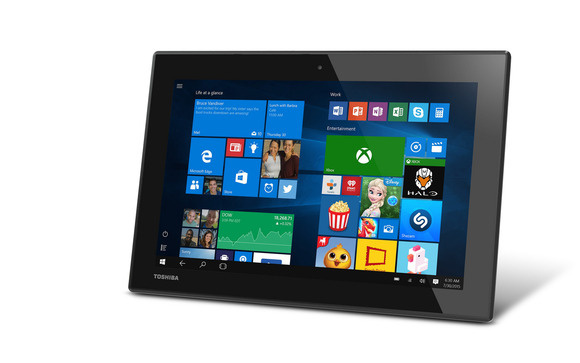 Attention road warriors: Toshiba just announced a new low-cost tablet-laptop hybrid packing Windows 10, a better-than-1080p display, and Intel’s energy-efficient new Atom “Cherry Trail” x5 processors. The Satellite Click 10 is one of the earliest lightweight Windows 2-in-1 devices to pack an Atom x5, following in the footsteps of Microsoft's Surface 3. Toshiba’s also got a entry-level starting price to complement the Click 10’s entry-level CPU: $US350. That cash buys you a 10.1-inch multitouch display with 1900-by-1200 resolution, along with a quad-core 1.4GHz Atom x5-Z8300 processor, Windows 10, 2GB of RAM, and your choice of 32GB or 64GB of onboard storage. The device also packs an 8 megapixel rear-facing camera, a 2MP front-facer, multidirectional TruTalk microphones, micro HDMI, microSD, a USB 2.0 slot, and Dolby Digital Plus speakers. The device has a 0.36-inch profile and weighs 1.2 pounds in tablet mode—add another pound with the keyboard connected. The Satelllite Click 10 is available for pre-order now with an estimated ship date of Friday, September 25. The impact on you at home: We’re finally starting to see the early debut of high-end new machines built around Windows 10's flagship features, like the Toshiba Satellite Radius 12. But the introduction of budget laptops like the Click 10 are just as important, since they provide an easy way to add a Windows 10 machine to your travel gear without adding too much weight. The Click 10 is also one of the earliest hybrids to come packing Intel’s Cherry Trail-based Atom x5—a beefed up version of Intel’s Atom line that promises better graphics. Archos also announced an x5-packing laptop in late August but that product will only roll out in France to start, and it won't hit the streets until November.